Robotics engineering involves developing robots to perform complex activities that humans are not competent enough to execute. In addition to this, it is also used to improve the productivity of many industries. 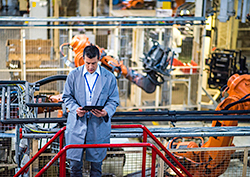 Robotics is widely used in the manufacturing automation industry. Automated systems are used to simplify and optimize difficult processes and reduce the overall cost. Read on to learn more about the field if you are looking for new job opportunities in the manufacturing industry. Positions in design and research and development departments to help generate new ideas. A place within the Original Equipment Manufacturers or OEMs to create unique products. Working with components and subsystems to help produce the basic workings of a robot for a specific activity. Getting a job as a system integrator to help develop methods to combine production activities with robotics. Individuals who are looking for a job or searching for opportunities to advance their career as a robotics engineer should be aware of the requirements in Toronto. In addition to this, having a network of contacts can also prove to be a valuable asset. This is the reason why it would help you to consult with a professional placement agency. Winters Technical Staffing is a well-known staffing agency in Toronto with over 40 years of experience. We have qualified consultants who can help you find a job with the right organization that meets your needs. To get help with your career as a robotics engineer, talk to our staffing experts by calling 647-556-2408.